Happy New Year everyone! Last year was a good year and I plan to make this year even better. Last year I began my teacher blog and opened a Teachers Pay Teachers store. I never thought I would have made it this far with both of these projects. Blogging has definitely helped me build good relationships as well as strive to be even a better teacher. I want to THANK YOU so much for all the love and support. 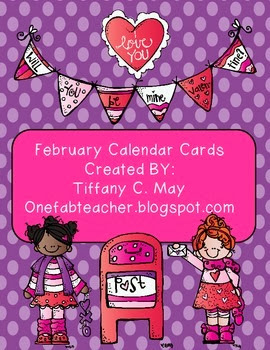 I've been in the creating mood, so I decided to create more calendar cards. These are for February. I also have January cards available as well. Just click on the photo and it will take you to my store. Happy New Year!! Ms. May u are such an inspiration! I love all ur positive outlook and most of the time your quotes help remind me that I can only be the best I can be for my kiddos :) thanks for being awesome. Hi Miss May! I just LOVE the bright colors of your blog! I was actually just thinking the same thing about how blogging has rejuvenated me a bit with my teaching (I just started blogging 3 weeks ago...but I am easily inspired by all the wonderful ideas)! Of course, I have always loved teaching and just like you, I was born to do it!! I am glad I found your blog today! Thank you so much Kate. This was a nice comment to read before I went to bed. Welcome to the blogging community and I will definitely be in touch.